The company manufactured a variety of gas engines and deck machinery through the early part of the 20th century. However, when the Depression occurred in the 1930’s, demand for engines and fishing equipment diminished and many businesses closed. 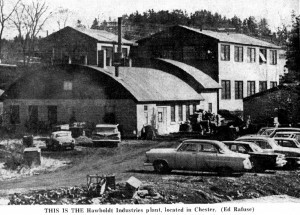 Hawboldt’s adapted to the changes by shifting production to water pumps, hot air furnaces as well as gymnasium equipment. 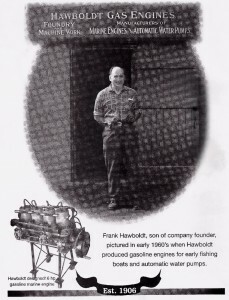 In the post World War II years the Hawboldt company diversified again as the fishing industry rebounded. In addition to engines, the firm manufactured deck machinery, trawl winches, cast propellers, gurdy haulers and anchor windlasses. Frank Hawboldt, Forman’s son, recalled that much of their business was done for clients in the Magdelen Islands. Forman Hawbolt retired from the business in 1946, leaving the company to his sons Frank and Bruce and to Raymond Armstrong. Frank Hawboldt, a trained mechanical engineer who had been with the firm since 1932, became the company’s general manager. On October 1947, a fire broke out at the foundry which gutted the main building. The Mahone Bay Fire Department was called in to assist the Chester Volunteer Department. Although retired, Forman was one of the first to arrive on the scene. “Foreman was known locally as a very generous employer who treated his employees with respect and dignity. I have known a lot of these men and they always have maintained a great respect for Foreman and his kindness toward them.